Junior linebacker Gabe Garber, left, and senior cornerback Mason Spellmeier, right, provide downfield blocking on this interception by senior defensive back Braeden Cox, who went 70 yards for the touchdown on Friday, October 12, against Wamego. Wamego’s Red Raiders came to town last Friday, Oct. 12, sporting a 4-2 record and looking to play the spoiler in the Bluejays undefeated record. In spite of the wet field conditions, Sabetha’s defense swarmed the Raiders to keep them scoreless and cruise to the easy victory 56-0. Sabetha had 188 yards to Wamego’s 134 in the first two quarters. The Jays had three possessions and scored four times — with help from the defense — and jumped out to a 28-0 lead in the first half. Tristan Edelman scored on a 1-yard run early in the first quarter, and Joseph Gruber capped off a 12 play, 86-yard drive with a 2-yard tote to the end zone early in the second quarter. 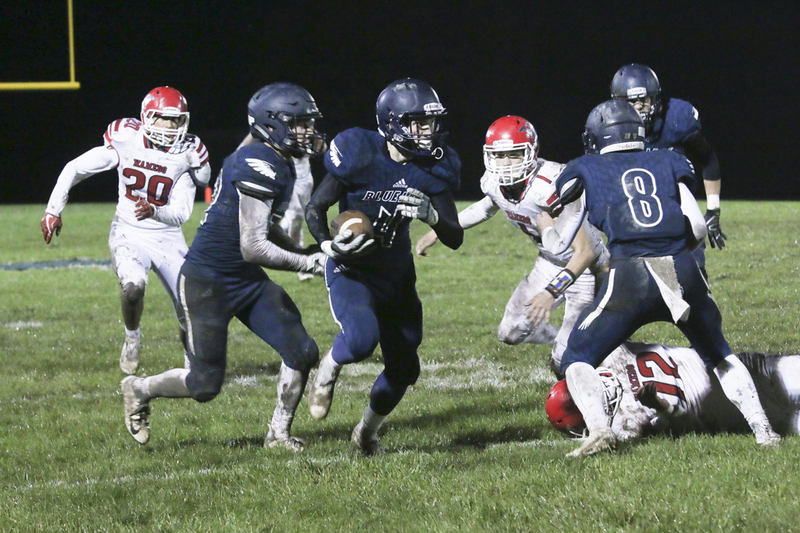 Quarterback Gabe Garber connected on a 26-yard pass to Ryan Stapleton in the waning minutes of the half for a score, and Braeden Cox intercepted a Wamego pass and took it to the house from 70 yards out with 31 seconds remaining before the intermission. Garber culminated the opening drive of the second half with a 1-yard carry to the end zone to make the score 33-0. On Wamego’s subsequent possession — punting from deep in their own territory — the kick was blocked and recovered by Joel Hackney who ferried it into the end zone for the score. Sabetha led 40-0 headed into the final frame and commanded the field with every possession without being forced to punt the entire night. Mason Spellmeier and Drew Schmelzle added the final two daggers in the fourth quarter, both capping off drives with 3-yard touchdown runs. “Our kicking game had another great performance, keeping the ball away from their dangerous returners and kicking another 27-yard field goal,” Coach Michael said. Cox — the kicker — contributed 14 points in the 56-0 victory with a touchdown on an interception, a field goal, and five P.A.T.s. Sabetha improves to 7-0 on the season. The Bluejays take on the 2-5 Royal Valley Panthers on the road on Friday, Oct. 19, to close out the regular season. Senior Ryan Stapleton seals the edge, which allows senior running back Joe Gruber to cut upfield on Friday, October 12. Junior Colby Tinklin and senior Braeden Cox close in and contain this Wamego ball carrier during first half action on Friday, October 12. Senior offensive lineman Cauy Rokey seals off his defender on this running play as junior quarterback Gabe Garber prepares to hand off on Friday, October 12. Sophomore Drew Schmelzle, senior Tristan Edelman, junior Carson Ukele and senior Elliott Strahm protect junior quarterback Gabe Garber in the pocket on this pass attempt on Friday, October 12, against Wamego. Senior Cory Geist pushes upfield on this pass rush and maintains his pass lane on Friday, October 12, against Wamego.